In his ageless exploration of depression, The Anatomy of Melancholy, Robert Burton lists sickness, solitude, jealousy, disappointment in love and religious melancholy as different shades of depression; these form the skeleton of the exhibition carrying the same name at the Bethlem Museum of the Mind. Although small in size, this exhibition is not one to be missed. The Anatomy of Melancholy pulls together work from great artistic minds that have passed through the doors of the Bethlem Gallery. These include names as resonant as Richard Dadd, as well as artworks born from lived experiences with depression in less medical contexts. ‘Melancholy is familiar to all of us to some degree, not as a diagnosis, but as a condition’, Collin Gale, the curator of the exhibition notes. The multi-faceted nature of depression is very well reflected in the diversity of the artworks in the collection. Right by the entrance, we stand before a painting of a broken branch. Seemingly alluding to the brain through its ramifications resembling neural networks, the painting by Ron Peponis invites reflection on the link between physical and mental health. This is topical, especially in the wake of new evidence that physical health problems, such as inflammation, can increase the risk of depression. Not unsurprisingly, the exhibition features two paintings of the Victorian troubled genius, Richard Dadd. 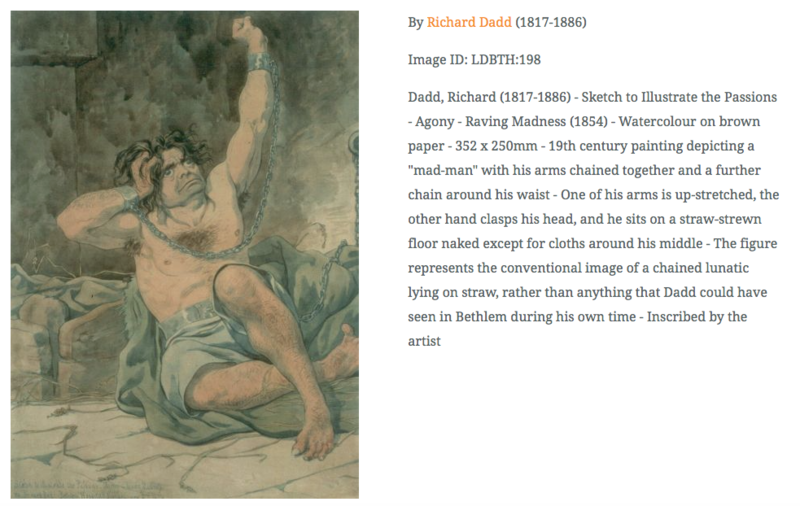 One of them is Agony – Raving Madness (1854), which portrays a chained man, aloof, staring his big eyes into nothingness. Originally intended to satirise the portrayal of mental illness during the Victorian era, in the context of the exhibition the artwork could serve as a reminder that depression might result from a lack of freedom – freedom to see things differently or what Robert Burton calls ‘insanity’. Keep on walking and you’ll get an unfiltered insight into psychosis. This is the work of Figgy Fox, morphing wavy coloured purple shapes fluidly into creatures in an eerie, sinister night-time landscape. Adding dynamism to the exhibition through its strong chromatic and distorted representations of human characters, Ronald Kimberly’s paintings are dominated by seductive, yet aggressive red tones, vividly capturing jealousy and violence in love. In one of the paintings, the female subject loses integrity, being reduced to her very body parts. Perhaps ‘we are torn in pieces by our passions, as so many wild horses…’, as Robert Burton notes in The Anatomy of Melancholy. We move on and we come across the artwork of Elise Warriner Pacquette. On a canvas uncomfortably stretched, itself intensifying the discomfort that the painting denotes, we are introduced to a melancholic perspective of solitude. The painting alludes to the isolating experience of feeling misunderstood and laughed at, a representation of ‘the quiet screams of frustration’, as the artists explains. She adds, ‘It was a starting point for discussion. Finishing the painting brought relief and vindication’, as well as confidence and acceptance of the feeling. The ‘Remedies’ section occupies a special place near the exit, perhaps as a necessary consolation. In juxtaposition with the range of medication neighbouring it, the work of Xavier White depicts a cyclist puzzled. His bike has been dismantled, however its components are still there, forcing us to ask ourselves, before we leave, how to put them back together. The Anatomy of Melancholy gives a fruitful insight into of a visceral aspect of humanity. The wide range of paintings illustrate the complexity and intensity of melancholy, allowing the viewer to immerse themselves into these states of mind from a healthy distance and help to build a better understanding of mental health issues. The exhibition is available until 27 April 2019.